Connect and Inspire – Use creative art and outdoor experiences to help people ‘connect’ socially with each other and with nature, whilst using local green spaces and the wider natural landscape to inspire health, fitness and wellbeing. Be Active and Be Creative – Promote both ‘active’ and ‘creative’ engagement with nature through green exercise, landscape art and photography activities. Keep Well, Learning and Improving – Use the ‘Ways to Wellbeing’ as an effective wellbeing, lifelong learning and self improvement tool for ourselves and others – especially when used in conjunction with ‘art’ and ‘nature’. Problem Solve and Innovate – Use our ‘artistic’ abilities and ‘problem solving’ approaches to design therapeutic spaces and high quality green space environments which convey both a wellbeing and environmental message. Be Responsible, Caring and Sustainable – Engage with business, encouraging them to show their ‘human-nature’ through corporate social responsibility (CSR), generating a funding stream which supports our aims to create WIN-WIN-WIN outcomes for business, community and environment. Also to be environmentally responsible ourselves in our own operations. Collaborate – With other health care providers, partners organisations and fellow artists ‘collaborate’ to use the arts, nature and landscapes to provide a sense of ‘escape’ and to promote a more positive sense of wellbeing. Give Back – Use any surpluses to improve access to high quality local green spaces and the wider natural landscape for those who don’t have ready access. Where possible ‘bring nature closer to home’ for those confined to a more urban environment. 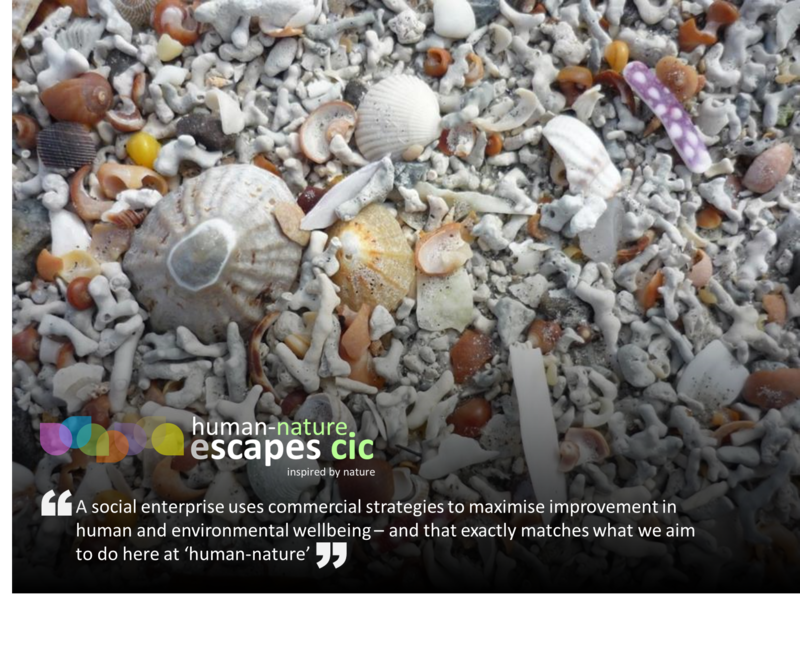 Human-Nature Escapes is a ‘social enterprise’ (community interest company or ‘cic’ for short). A social enterprise is a relatively new kind of organisation which is similar to a business, but rather than using profits to pay share holders, it places profits back into the community or the environment – to do some social good. Essentially a social enterprise uses commercial strategies to maximise improvement in human and environmental wellbeing – and that exactly matches what we aim to do here at Human-Nature. We’re not a charity, so we need to sustain ourselves through trading – and not be reliant on funding or donations. Instead we must our business acumen and problem solving abilities, combined with our creative abilities, to deliver solutions and services that add social value and meet local community needs. Our chargeable services to corporate business and the support we receive through CSR, mean that we can offer our services to community and individuals which are reasonably priced, and even no cost to certain participant groups. However we do deliver services which are high value. Being small, agile and innovative, allows us to be uniquely different, more tailored and offer more choice – and more likely to meet our clients’ specific individual needs. We aim to be open and transparent with where the money comes from and goes to. We do of course have to make sufficient money to pay our own wages, but we aim to earn modest salaries which are comparatively less than our counterparts in the commercial sector – with our salaries being comparable to those earned by the charity sector. Our primary focus is not just to make money, but to make a difference with that money. That might sound rather utopian to some, but we believe that with the right vision, and with the right people, with the right passion behind that vision, then it’s a business model that can really work. We certainly see it working for us.